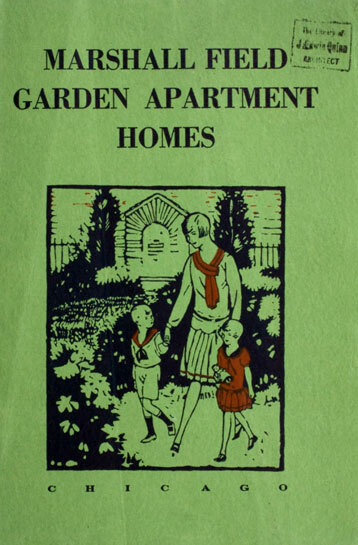 When completed in 1929, the Marshall Field Garden Apartments were the largest middle-income housing development in the country, with a total of 628 units in ten buildings spread over two city blocks with large interior communal courtyards and street side retail stores. 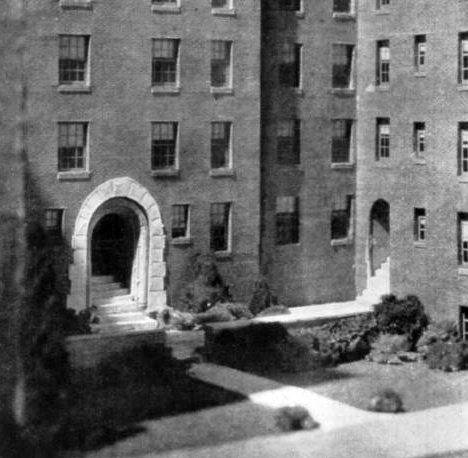 Modeled after the New York City Dunbar Apartments built by John D. Rockefeller, Jr., in 1926, these apartments were one of the nation’s earliest attempts at privately financed affordable housing. For the first time in Chicago non-profit apartment buildings are being erected, and on a scale sufficiently large to permit high grade construction costs lower than any known heretofore. The result is an opportunity for 628 families to secure, at an average cost of only $15.00 per room, per month, an apartment that, for size of rooms, for convenience of layout, for modern appointments, and for accessibility to transportation, to parks and to the Loop. is the equal of apartments renting as high as $25.00 to $30.00 per room in other sections of the city. 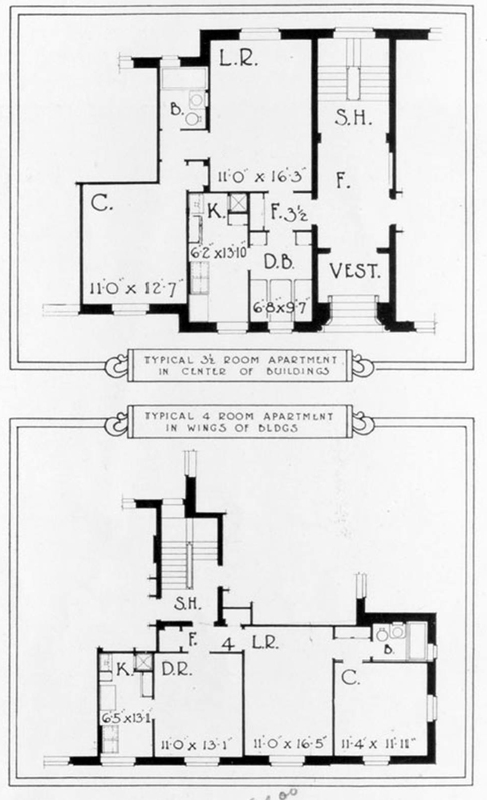 Every apartment has outside light and air, and fronts either on a street or a spacious garden court. 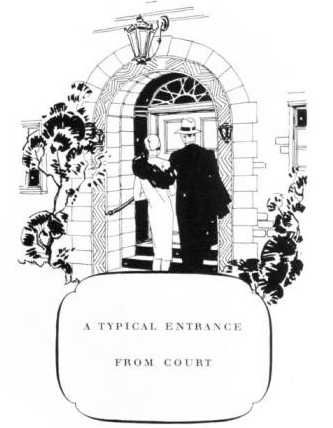 The motive of the Estate of Marshall Field in planning and building and renting these great apartment buildings is directly in line with the policy of the Trustees to keep a substantial portion of their capital invested in well interest return of 5%. There is no profit—no charge for financing—no mortgages to pay—no padding. Thus great economy is possible, and cannot approach the low rentals here offered. 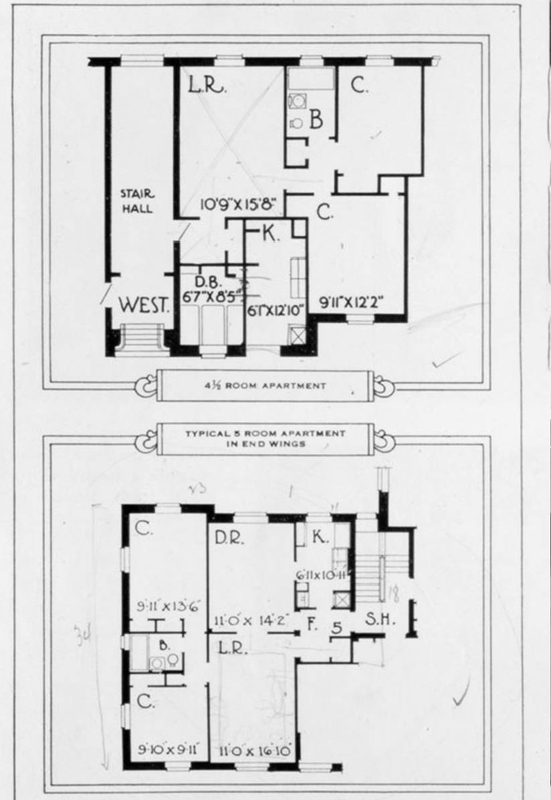 Preliminary to the construction of these buildings, which are called the Marshall Field Garden Apartment Homes, the cooperation of the University of Chicago Social Research Department was secured to determine the most advantageous location for such a project. After a careful study of various sections of the city, a site was chosen covering two square blocks between Blackhawk and Sigel Streets and Hudson Avenue and Sedgwick Street, on the near north side. Many things combine to make this an advantageous location: it is six minutes from downtown by elevated, it is within ½ block of two elevated stations; the Sedgwick Street car line is on one frontage of the property Lincoln Park with its bathing beaches and other recreational facilities is only five blocks away; Parochial schools, the Lane Technical High School, and churches of all denominations are within from one to five blocks. Not alone because of its present advantages was this location chosen. The northward growth of the downtown district will, in the not distant future, cause most of the older developments between the Chicago River and Lincoln Park to give way to new and modern buildings. Already many fine apartments are being built within a few blocks of this site, and in the near future this section in the opinion of those who are familiar with the present trend, will enjoy even greater desirability as a place to live. This was an important factor in selecting the location for the original plan was to sell, rather than to rent, the apartments at cost. 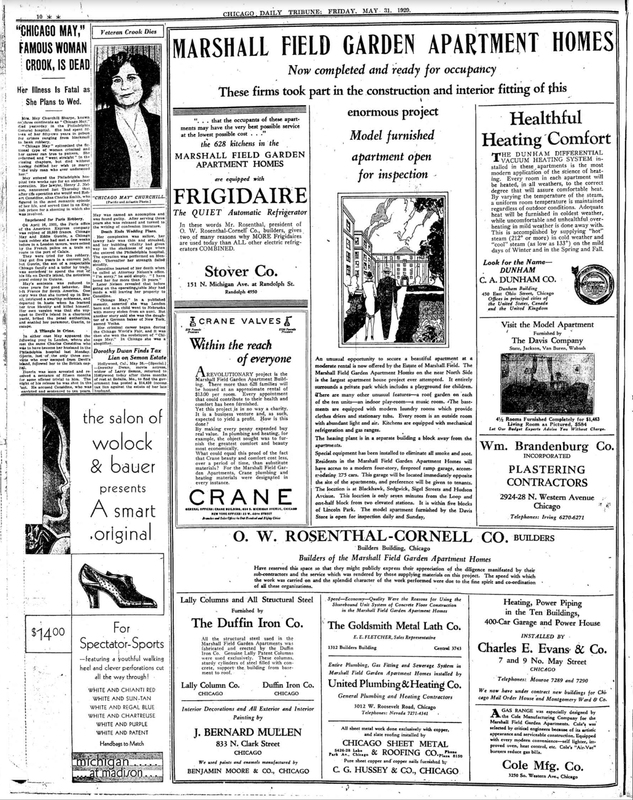 The lack of adequate legislation to permit the operation of so large a project on a cooperative basis has made it impossible to employ a selling plan at present time, but, as soon as the efforts of those interested in modern housing are successful in procuring legislation that will make large cooperative enterprises possible, each tenant will be given an immediate opportunity to own his own apartment on small monthly payments. The original plan to sell was likewise responsible for making every apartment finer than is customary in buildings put up to rent. In the general layout of the buildings, which are designed to give every foot of space has been planned for maximum comfort and usability. Photographic reproductions taken from the models of the buildings. The rooms are spacious, the average living room being 17 x 13, the dining rooms 12 x 15, the bed rooms 11 x 13 and the kitchens 8 x 10. The buildings are fireproof, with concrete base soundproofed floors. The kitchens have the very latest equipment, including cabinets, gas ranges, mechanical refrigeration, combination sinks and wash tubs, and dumb waiters for service deliveries. The modern basement laundry rooms are supplied with modern wash tubs, gas stoves and dryers, and electrical connections for washing machines. Every apartment has a full size bathroom equipped with built-in tub, medicine chest, and up-to-date fixtures, for which no rent is charged. Those apartments designated at 3½ rooms and 4½ rooms have half-size dining alcoves instead of full dining rooms, and these are charged for in the rental scale at one-half the monthly rate of full rooms. The average monthly rent per room, based on a carefully prepared estimate of operating expenses and a 5% return on the actual cost of the development, is $15.00. Apartments may vary in desirability, however, so that the actual range of rents will run from $13.00 to $16.50 per room per month. It will be possible, therefore, to obtain 3½ room apartments at $55.00 per month; 4 room apartments from $52.00 to $66.00; 4½ room apartments at $72.00; 5 room apartments from $70.00 to $82.50; and 6 room apartments from $81.00 to $97.50. Equally important with the economy, the efficiency and the spaciousness of these apartments, is the large and beautifully landscaped park enclosed by the buildings. In area it is larger than the average city block. Its lawns and trees and shrubbery will provide such natural surroundings as are obtainable elsewhere only in the suburbs. Yet here they require no sacrifice of the conveniences of a home near to the business districts. This park includes a playground for children, and opening on this area is an indoor playroom for use in bad weather. These facilities will be in charge of an attendant, with a completely equipped first-aid room close at hand. A rest room for mothers and small children is also provided as an adjunct to the playgrounds. 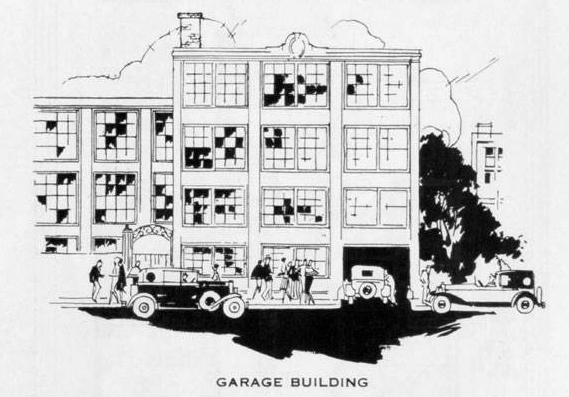 A garage has been erected on Sedgwick Street, east of the apartment buildings, extending through to Orleans Street, and providing accommodations for a approximately 350 cars. Residents of the Marshall Field Garden Apartment Homes may store their cars here at rates as low as the cost of operation will permit. The heating plant for all the apartments adjoins this garage building. Uniform heat is assured to all apartments, and the location of the heating plant, over one-half block away from the nearest apartment, together with the use of the latest engineering methods in heating, guarantees a complete absence of smoke and dirt from this source. It is certain there will be in the Marshall Field Garden Apartment Homes a community spirit seldom found in a big city. This will be fostered by the unusual facilities for getting acquainted and for mutual enjoyment of the many features of interest maintained in the buildings. There will be a large auditorium for meetings and entertainments, with a well-arranged kitchen adjoining. A music room with a piano will be supplied for the use of those children who wish to take piano lessons and it is hoped in time to install a library for the use of the tenants. Glass-enclosed sun-porches are at the top of each building for the use of the occupants. One important factor that will make residence here desirable is the care with which applications for tenancy will be investigated. While there will be no religious or class restrictions, the character of each applicant will be established before acceptance. Thus each resident will be assured of the desirability of his neighbors and of the wholesomeness of the environment. In time it is hoped that an advisory board of tenants can be formed to cooperate with the management in the furthering of plans that affect the common welfare. A voluntary Association will be formed among the residents of the Marshall Field Garden Apartment Homes for the purpose of securing life insurance benefits, the premiums on the policies to be paid entirely by the Marshall Field Garden Apartment Homes. This insurance will be under an Association group plan whereunder tenants between the age of 21 and 60, inclusive, who are acceptable to the insurance company and to the Marshall Field Garden Apartment Homes will be eligible for membership. 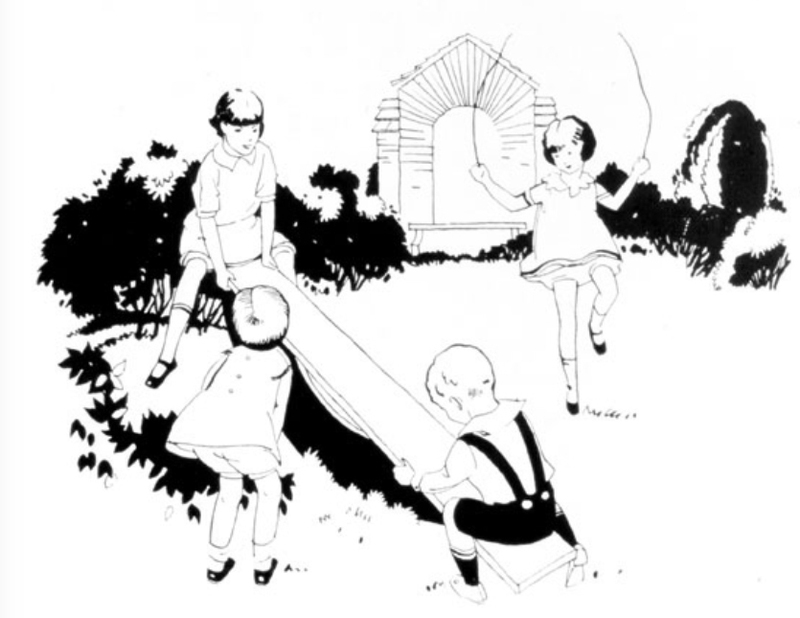 Every member will be insured in the sum of $1,000, payable in the event of death from any cause, and, in the case of total and permanent disability caused by injury or sickness before the age of 60, the insurance will become payable in the same manner as in the case of death—in lump some or in monthly payments. The proceeds of the policies will be payable to the Marshall Field Garden Apartment Homes to be applied in such manner as may serve the best interests of the tenants. 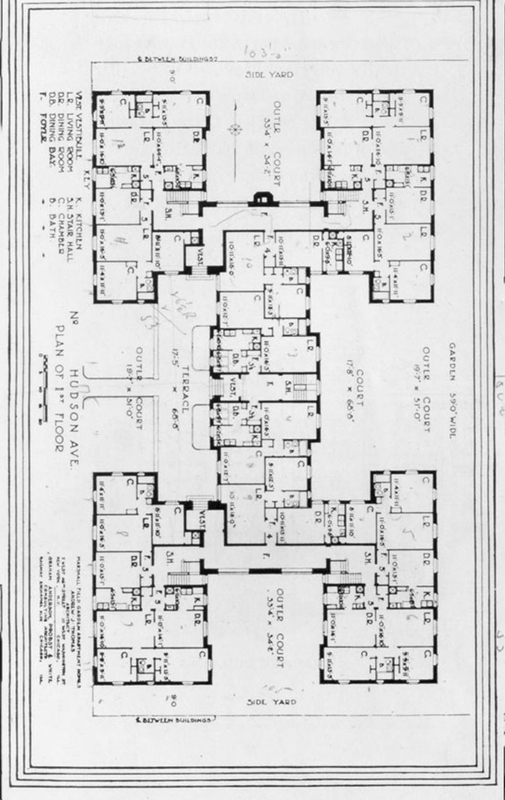 The first unit of the Marshall Field Garden Apartment Homes will be completed by January 1st, 1929, four additional units will be ready for occupancy on February 15, 1929; and the remaining five units will be finished not later than April 1, 1929. Models of the buildings are now on display in the lobbies of the Pittsfield and Conway Buildings. Applications should be made to the Renting Office. The control of this work is in your hands, and no appeal of any kind is to be made to the Trustees, unless absolutely necessary. No discrimination is to be made as to religion. Men who have worked on the buildings and have done their best are to have preference. Only persons with moderate incomes are to be considered, as the buildings have been erected to help those actually needing low rents. The usual rule with many landlords excluding families with children is to be reversed by giving preferences to families with children. References of every tenant are to be investigated to insure the exclusion of persons found to be immoral or otherwise undesirable. 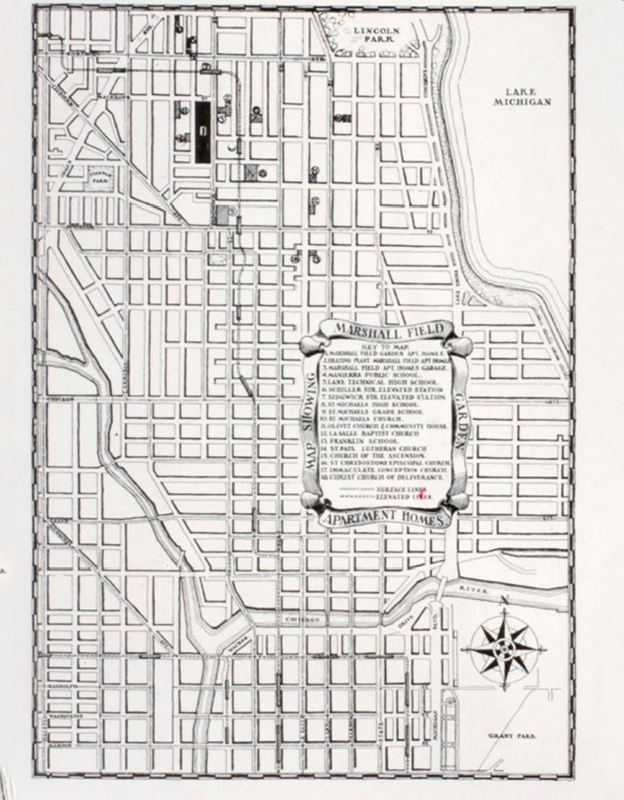 To visit the Marshall Field Garden Apartment Homes take the Ravenswood Elevated to Schiller Street station and walk one-half block west; or to Sedgwick Street station and walk one-half block south; or take the surface line which runs north and south on Sedgwick Street.